This book has been on my radar for a while. After reading Diary of A Country Priest in a few different courses in school I had always intended to circle back, but had not done so. This specific book had been recommended to me a few times, but it was out of print and hard to track down. That has now been resolved by Cluny Media. Cluny is in the process or restoring to print in new editions many Catholic Classics. They have the goal of promoting Catholic intellectual and cultural tradition. They are bringing back into print works of theology, philosophy, history, science, and literature. And unlike some other publishers who release revised versions, or edited version, or release books under a new title every few years, Cluny appears dedicated to keeping the classics classy. These are new fresh typeset editions. In Quality paperbacks and excellently formatted eBook edition. 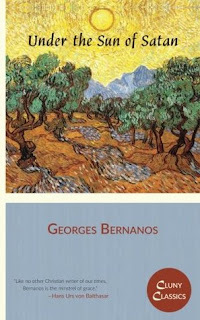 Bernanos is considered one of the most important France Catholic, if not just Catholic novelists of the 20th Century. He is known for his penetrating insight into people, and their intentions and drive. This book at first seemed like a disjointed work. It was not until I was almost through the novel that the pieces came together and clicked and a realised cohesion in the novel. I will be honest at times this was not an east story to read. Reading about the priest’s self flagellation, and the young woman’s mental anguish, and self abuse was not easy to stomach. His ability to capture spiritual anguish and anxiety is penetrating. His representation of a trial with the devil is dark and disturbing. The story at first appeared disjointed. But once the different arcs of the story come together it culminates in a very powerful way. This book is not for the faint of heart. It was a hard read but, in the end, well worth it. I cannot say I loved this story. I did appreciate it. But I can categorically state that these new editions by Cluny are excellent. Both in their quality, and for the fact that they are bringing back in print classics such as this story. I look forward to reading many more books from Cluny as they are continuously expanding their offerings.